It’s time to look at another classic NES game thanks to the MyNintendo Rewards. This one is a clear step up from City Connection and actually feels like a real game. Right away I can tell you that this is a good thing. The game has a plot, solid gameplay, and could be mistaken for a more modern game. It wouldn’t be out of place on the Super Nintendo. I won’t say that the game was amazing, but I would call it one of the better games on the console. The game’s difficulty also lives up to its reputation as you will have a very difficult time trying to beat it without a good save option. The game starts with Ryu getting knocked out by a mysterious lady. She explains that he has to fight and survive while dodging the enemies. He is understandably confused, but has no time to ponder this as the CIA arrives and they also knock him out. They task him with finding two statues and saving the world or they will destroy him. Ryu will do that, but along the way he also has to find his father as well as rescue the agent who knocked him out in the beginning. It’s going to be a long day, but that’s nothing new for the warrior known as Ryu. The gameplay is that of your typical 2D platformer. It’s almost like a beat em up as well, but the game technically doesn’t force you to fight the enemies. I would recommend it though as otherwise they will get sneak attacks on you. A single fall means doom and there are a bunch of places where you can fall. Some enemies will respawn infinitely though and keep in mind that if you turn back for whatever reason any enemies in front of you will reappear as well. That’s why you must never backtrack. You can run, jump, and swing your sword. Additionally by holding up and pressing the slash button you can use whatever super attack you have at the ready. The fire balls are really good as well as the boomerang ninja star. There are 20 levels but you only get 3 lives. If you don’t use the super save feature then I imagine that you will die around world 2. The game is super challenging, but rarely does it feel unfair. At most some of the enemies could seem a little like they are luck based in regard to hitting them before they hit you, but I think with perfect timing you can probably get around that. I can’t really say one way or the other there, but it seems possible. There isn’t any replay value after beating the game, but that along should take you quite a while. The graphics are pretty solid and have aged very well. The character designs are good and the game even has images and text like a more modern game. The illustrations are quite good and we even get a number of solid plot twists. It really makes the whole game a lot more personal for Ryu. There is a soundtrack as well even if I can’t recall any of the themes. They all sound a little similar plus you will be far too busy trying to survive to actually listen to what the music sounds like. Overall, This game was actually fun. 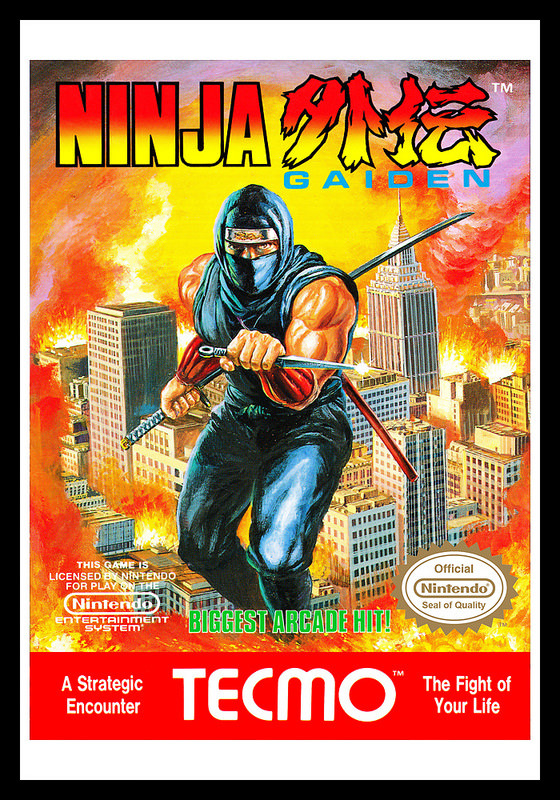 Ninja Gaiden is a title that I would certainly recommend to others. It gets the fundamentals right so then everything after that is a nice bonus. This game is just the complete package and it might have the best plot for any NES game. That could be a stretch, but at the moment I can’t think of any that are better. If you’re looking for a good game on the E-shop then look no further. This is the kind of game that you want to check out and you will also be able to appreciate a part of gaming history! This entry was posted in 7 Star Games, Game Reviews, Games, Reviews and tagged Game Review, NES, Ninja, Ninja Gaiden, Nintendo, Retro Game, Retro Review, Review, Techmo, Video Game Review by dreager1. Bookmark the permalink.